Introduction Tortuous vascular anatomy is one of the greatest challenges in mechanical thrombectomy. This study examines the impact of vascular tortuosity on the performance of stent retrievers and evaluates the efficacy of the newer generation stent retrievers with segmented design. Materials and methods Models with mild, moderate, and severe tortuosity with an internal carotid artery (ICA) and a middle cerebral artery (MCA) were created. An elastic and cohesive clot was placed in the MCA lying from distal M1 and proximal M2. We assessed the revascularization rates of two commonly used stent retrievers (Trevo XP and Solitaire FR) and two newer stent retrievers with segmented design (Embotrap and Versi) in each vascular model. Results Both the type of stent retriever and the severity of vessel tortuosity significantly affected the successful recanalization rate. Post-hoc tests showed that the rate of revascularization was significantly less in severe tortuosity than in mild or moderate tortuosity (P<0.001). The Versi resulted in higher success rates than the Solitaire (P<0.01) and the Trevo (P<0.05). The success rates of the Embotrap were higher than the Solitaire and Trevo stent retrievers, although the difference was not statistically significant. Conclusions Severe tortuosity reduces the performance of mechanical thrombectomy. The segmented design in stent retrievers could improve the efficacy of mechanical thrombectomy in tortuous vessels. Trial registration ESCAPE NCT01778335;SWIFT PRIME >NCT01657461; REVASCAT >NCT01692379; All post-results. Recent randomized controlled trials have shown mechanical thrombectomy with stent retrievers to be an effective treatment in eligible patients with acute ischemic stroke.1–5 Subanalysis of the studies (ESCAPE, SWIFI PRIME, REVASCAT) showed that image to reperfusion time significantly affects the clinical outcome.6–8 Therefore, it is imperative to achieve final reperfusion per se and also to increase the first-pass reperfusion rates for better outcomes. One of the challenges in mechanical thrombectomy is the tortuous anatomy of the vessels. An acute angle of the target vessel is associated with a lower success rate.9 10 During mechanical thrombectomy in curved vessels, stent retrievers are stretched, collapsed, and can lose capture of thrombi on account of their resheathable structures. However, the mechanisms for poor angiographic and clinical results in tortuous vessels have not been studied. Newer generation stent retrievers with segmented designs may offer the possibility of improving the efficacy of mechanical thrombectomy in tortuous anatomy. The aim of this study is to assess the impact of vascular tortuosity on the performance of stent retrievers and to evaluate the efficacy of the newer generation stent retrievers that have a segmented design. Vascular models used for the experiments. (A) Mild tortuosity. (B) Moderate tortuosity. (C) Severe tortuosity. The silicone vascular models were prepared according to the soft model described by Mashiko et al.16 The core was created using a fused-deposition molding (FDM) three-dimensional printing process with a copolymer of acrylonitrile, butadiene, and styrene (ABS), and was smoothed prior to silicone molding. Platinum cure silicone was prepared and vacuum degassed prior to applying to the core. The silicone was then cured at 100°C for 30–60 min. After 2–5 silicone applications the core was dissolved chemically, leaving the silicone vascular model. An elastic and cohesive clot was produced by mixing whole porcine blood, bovine fibrinogen, and thrombin containing erythrocytes, platelets, fibrin, and leukocytes, which is similar to human clot in terms of stiffness and elasticity, as described in the previous literature.17 A clot with a length of 10 mm and a diameter of 4 mm was placed in the MCA lying from distal M1 and proximal M2. The efficacy of two commonly used stent retrievers, Trevo XP 4×20 mm (Stryker, Kalamazoo, Michigan, USA) and Solitaire FR 4×20 mm (Medtronic, Irvine, California, USA) as well as two newer stent retrievers with segmented design, Embotrap 5×22 mm (Cerenovus, Galway, Ireland) and Versi 4×30 mm three segments (NeuroVasc Technologies, Laguna Hills, California, USA) was evaluated in each of the vascular models with different tortuosity (figure 2). Photographs of the stent retrievers used in the study. (A) Trevo XP. (B) Solitaire SR. (C) Embotrap. (D) Versi. The distal end of the stents was fixed with forceps and the proximal delivery wire was pulled with 5 g force (right). All stent retrievers were stretched by pulling, but segmented structures in Embotrap and Versi remained open (white arrows). The scale bar is 5 mm. The Embotrap is made of nitinol and composed of an inner stent for immediate flow restoration and an outer stent with a segmented design for integrating and capturing thrombi. The Versi is also made of nitinol and has 2–4 articulating segments which are alternately located in the stent. Radiopaque markers are attached to the proximal and distal ends as well as to each segment. Owing to the unique structure of the Versi, it expands further under traction while it is fully resheathable (figure 2D). Both the Embotrap and Versi are compatible with microcatheters with an inner diameter of 0.021 inch. The silicone models were connected to a perfusion pump (WVR, Radnor, Pennsylvania, USA) with tubing to control the hydrostatic pressure to 100–126 mmHg, representative of mean arterial pressure. The fluid, consisting of a 60/40% water/glycerin solution with detergent, which has a similar viscosity to human blood, was heated to 37°C and perfused in the circulation at a rate of 400 mL/min. The flow rate of the ICA and ECA was 240 mL/min and 160 mL/min, respectively. The flow rate of each vessel was verified with a flow meter before the experiments. The clot was delivered by flow and positioned from distal M1 to proximal M2. After placing the clot in the MCA, each stent retriever was deployed over the clot through a 0.021 inch microcatheter (Rebar 18; Medtronic, Irvine, California, USA) and an intermediate catheter (Sofia 6; MicroVention Terumo, Tustin, California, USA) was advanced to the ophthalmic segment in the mild and moderate tortuous model, or the distal petrous segment in the severe tortuous model to ensure a challenging test environment. After deployment of the stent retriever, a period of 90–120 s was allowed for the retriever to integrate the clot. Subsequently, the test device was pulled into the intermediate catheter. During clot retrieval, continuous aspiration was performed using a vacuum pump at the rate of 25–29 mmHg from the intermediate catheter, which is similar to the suction pressure generated by a Penumbra Max electrical pump and/or a 60 mL locking syringe.18 The entire procedure was recorded with a video cam (VZ-1HD; IPEVO, Sunnyvale, California, USA). Clot retrieval was scored as successful if there was no clot migration or visible fragmentation. Comparisons of successful thrombectomy between stent retriever type and the severity of vessel tortuosity were made using two-way analysis of variance (ANOVA). Comparisons of outcomes between stent retriever types within the different severities of tortuosity were then made using one-way ANOVA. Tukey’s honestly significant difference (HSD) was used following each ANOVA to locate significant pairwise differences. The threshold for significance for all statistical tests was 0.05. All statistical analyses were run in R.
Mechanical thrombectomy with each stent retriever was repeated five times in the mild tortuous model and 10 times in the moderate and severe models. The success rates of the stent retrievers in each severity model are shown in figure 3. In general, two-way ANOVA showed that both the stent retriever type (P<0.01) and the severity of the vessel tortuosity (P<0.001) significantly affected the success rate. Post-hoc tests for ANOVA showed that severe tortuosity led to significantly worse outcomes than mild or moderate tortuosity (P<0.001; Tukey HSD), but moderate tortuosity was not significantly worse than mild. In the severe tortuosity model, the Versi had significantly better outcomes than the Solitaire (P<0.01) and Trevo (P<0.05) retrievers. The Embotrap also resulted in higher success rates than the Solitaire and Trevo stent retrievers, although the difference was not statistically significant. There were no significant differences between stent retriever types in the mild or moderate tortuosity models. Success rates of mechanical thrombectomy using the stent retrievers. *P<0.05; **P<0.01. The behavior of the stent retrievers during mechanical thrombectomy was monitored by video. Two commonly used stent retrievers, Trevo and Solitaire, tended to be stretched and collapsed within the tortuous curve. 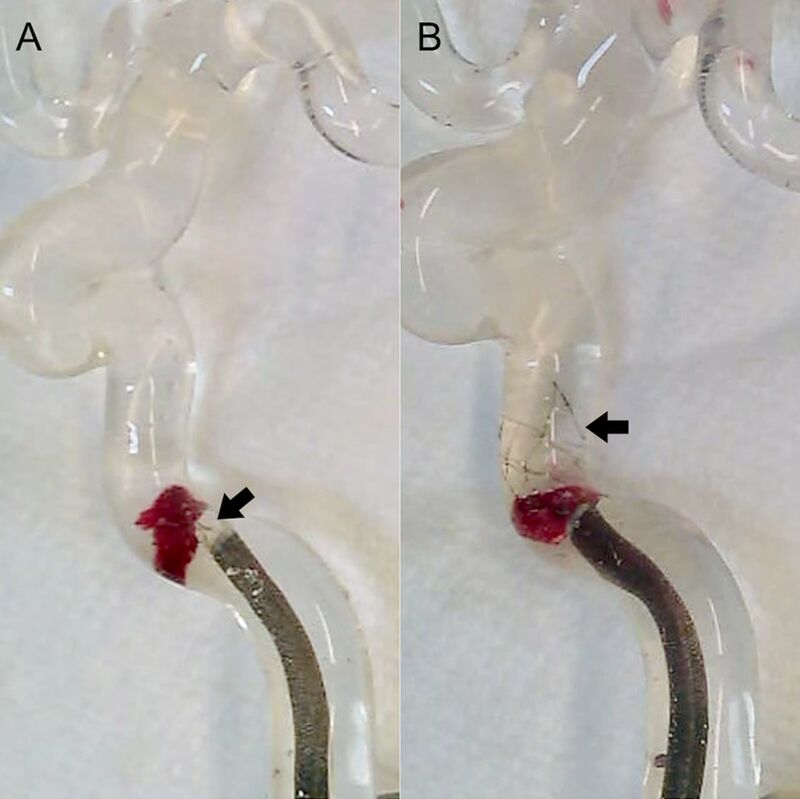 This collapsing expanded the space between the stent and the vessel wall, leading to dislodgement of the unintegrated clot into the original vessel or new territory by flow (figure 4A). 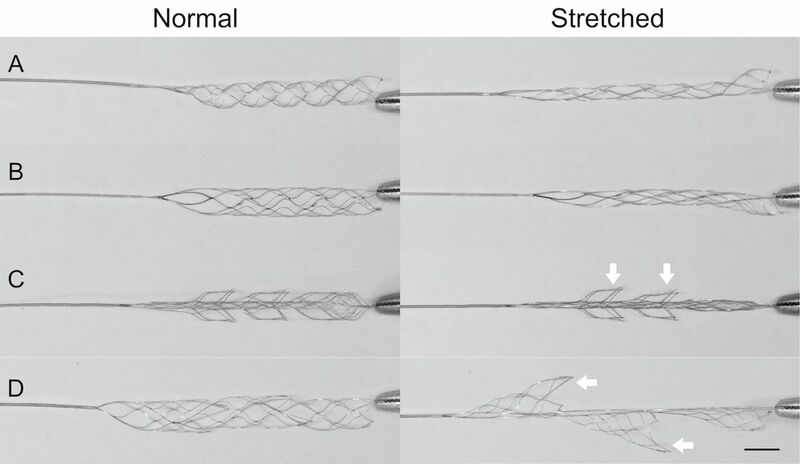 Although the newer generation stent retrievers also partially collapsed from stretching within the tortuous curve, the segmented design prevented collapse of the entire stent (figure 4B). In addition, clot fragmentation with distal migration was observed when the clot was distally placed within the stent and retrieved into the intermediate catheter. The clot was fragmented by the contraction of the stent pulling into the intermediate catheter and flowed as a distal embolus because of the circulatory flow (figure 5A). Distal placement of the clot was prevented within the newer generation stent retrievers due to the only partial collapse of the segmented stents (figure 5B). Stretched stent retrievers in vascular bends. (A) The stent struts of the Trevo XP are collapsed by the bends of the carotid siphon. (B) The segmented structure of the Versi remains open in the carotid siphon. Black arrow indicates the stent. Clot fragmentation when pulling into the intermediate catheter. (A) Ppart of the clot was fragmented and released when the clot was distally placed within the stent. (B) The clot was retrieved when it was placed proximal to the stent end. Black arrow indicates the stent. The character of the clot as well as the length and severe tortuosity of the vessel make clot removal by stent retrievers challenging. Although a number of clinical and in vitro studies have shown that fibrin-rich clot has high friction and relates to low success rates in hard clot retrieval,19–23 data studying tortuosity in mechanical thrombectomy are limited. 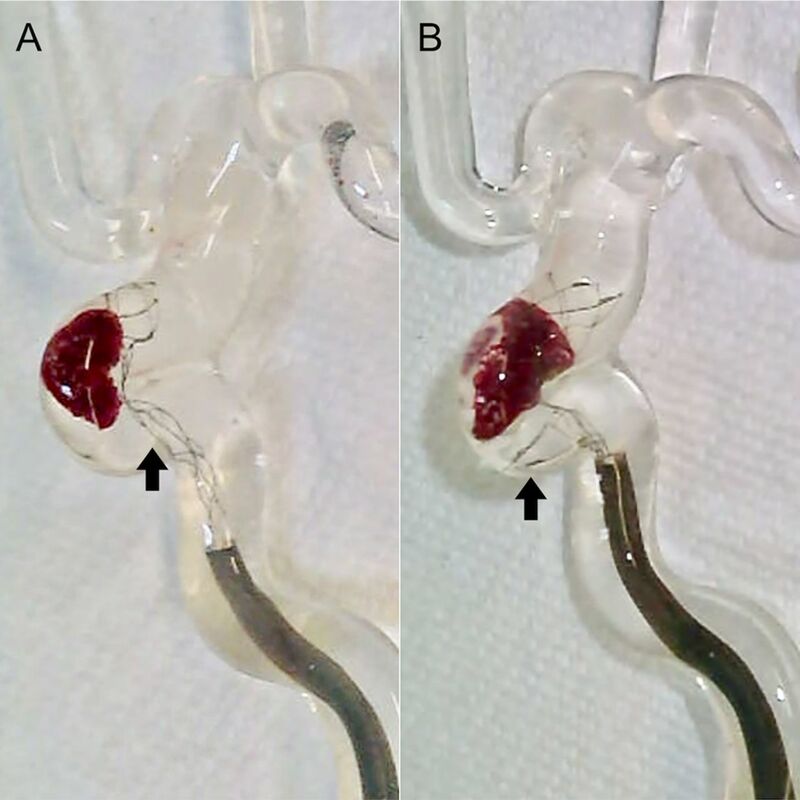 In this study, an elastic and cohesive erythrocyte-rich clot was used to see the efficacy of the stent retrievers in several vessel models with varying levels of tortuosity. To reproduce challenging case scenarios, proximal flow control with a balloon guide catheter was not used and a short waiting time after deployment was applied. The results from the study showed that the vascular tortuosity significantly affects success rates in mechanical thrombectomy. This finding is compatible with a clinical observation showing lower success in mechanical thrombectomy in the anterior circulation with large vessel angles.9 Fennell et al recently reported that hard clots were often dislodged in the tortuous carotid siphon by in vitro thrombectomy with the Solitaire stent.24 Machi et al also showed that elongation of the stent around a sharp curve reduced the interaction between the stent retriever and clot around the curve, resulting in dislodgement of the clot.23 In our study, this dislodgement was observed in tortuous M1 or ICA curves where the Trevo and Solitaire were elongated and collapsed (figure 4A). The stent segments of Embotrap and Versi prevented the whole elongation and part of the stents remained open even in the tortuous anatomy. Although multiple factors can affect the efficacy of thrombectomy, our results suggest that expansion due to the fragmented design can be one factor to improve success rates in tortuous vessels. Another observation regarding retrieval failure in the study was clot fragmentation, with distal migration when retracted into the intermediate catheter (figure 5A). This fragmentation is thought to occur more when the clot is soft and friable. The stent retrievers with a segmented design had less breakdown of the clot because of the lower likelihood of dislodgement of the clot into the distal part of the stent in the tortuous vessel. This observation indicates the importance of the use of a balloon guiding catheter, as confirmed in multiple clinical and basic studies.25–27 Nevertheless, a balloon guiding catheter, which is such a powerful tool, was not used in this in vitro study in order to enhance the difference in the clot capture performance among the four stent retrievers. The fragmentation could also be prevented by the partial capture of the stent retriever into an intermediate catheter with aspiration through both a balloon guiding and intermediate catheter (SAVE technique).28 In addition, a longer stent and deployment of the stent for proximal capture of the clot might also reduce the chance of this fragmentation. A limitation of this study is that artificial clots were used to test the stent retrievers. The clot was homologous and does not represent a complex clinical situation. In addition, unevenness of the specifications of the tested devices could affect the study result. They are roughly the same in diameter but different in length. The higher success rate of the Versi stent could be attributable to the longer length, although we observed that the clot was not dislodged because of the open segmented structure rather than the length. Tortuosity affects successful rates of mechanical thrombectomy. In this experimental model, mechanical thrombectomy with newer stent retrievers with segmented designs resulted in higher success rates compared with current stent retrievers. The safety and efficacy of these newer stent retrievers should be examined in further clinical studies.
. Diagnostic cerebral angiography: Lippincott Williams & Wilkins, 1999. Contributors NK: concept, design and development of the study, acquisition and analysis of the data, and writing of the article. YK: analysis of the data and writing of the article. HY: analysis of the data. ST: concept, design and development of the study and writing of the article. Competing interests NK has been a consultant for Neurovasc. ST holds stock in Neurovasc and has been a consultant for Cerenovus, Medtronic, Neurovasc and Stryker. Data sharing statement Any technical detail concerning the creation of the model and the results are available from the corresponding author.